Each customer is at the same time different and unique. So why should we treat them "like everyone else", sending mass, standard messages? Let's approach them in a more personalized way! Let's get to know their needs, analyze their behavior, and create the optimal message - in other words, LET’S SEGMENT! How can it help your e-commerce? 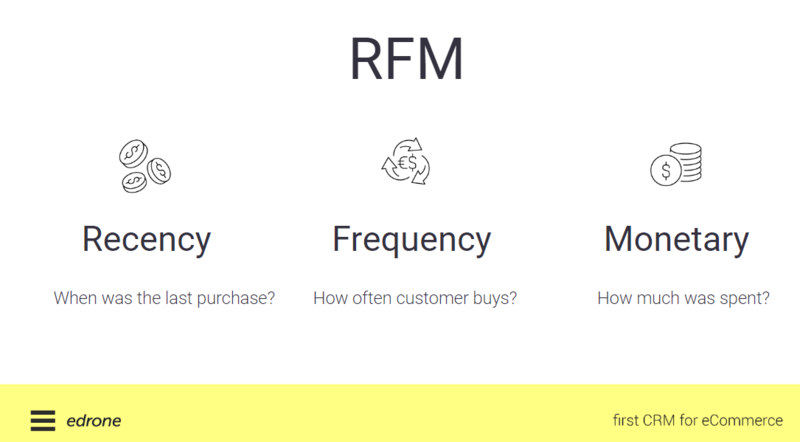 What are the RFM segments in edrone. Recency - how recently the customer made a purchase in your store. Frequency - how often does she/he buy. Monetary - how much does she/he spend. RFM segmentation is based on the Pareto principle, according to which 20% of customers generate 80% of your revenue. How can RFM segmentation help you? First of all, you get to better know your customers and have everything under control. You know who buys eagerly and who is losing interest in your e-commerce. You reach your customers with a personal, well-matched message. You approach them in an personalized way (and he/she can see it), and what’s more, your messages are not sent massively and do not end up in spam. RFM segmentation allows you to create more effective marketing strategies, and thus increase the visibility of your store and, of course, sales. Advanced data analysis gives you a significant advantage over your competition. In Edrone, we divide customers into ten segments. The data are presented graphically in the so-called RFM Grid. Champions - your best customers. They buy often and spend a lot of money. There is no need to give them high discounts, because they like to buy in our store no matter what. We need to make them feel special in a different way, for example, we can present them the preview of new collections, show the products which others can not see yet. Loyal customers - they like your store. They buy often, but do not spend as much money as the Champions. Nevertheless, it is also a very valuable group of customers. We should take care of them and try to make them Champions. New customers - they just got started as your customers. They bought something in your store, they gave you a chance, so you can not lose them. Build a relationship with them, don’t let them go to the competition. Need attention - if you don’t want to lose these customers, pay more attention to them. They haven’t bought anything from your store for a long time. Remind them about your shop, get involved in some action. Send information about new products or promotions. At risk - these customers are slowly forgetting about you. Don’t let them leave. Maybe a special discount for them? Lost - customers that you lost for some reason. Perhaps they choose the competition or your offer ceased to be interesting for them. Don’t worry - there is still a chance to “regain” them. Thanks to RFM analysis, you know who your customers are and you can send a personalized message to them. Inform about new products, give a high discount - make them come back to you. Let's segment your customers with edrone. Let's send personalized messages. Gain customers' trust. Let the success of your e-commerce give you joy and bring benefits!